Ross Landenberger first got into skateboarding at the age of 12, and can still remember his first experiences with the sport while growing up in Oak Ridge, Tennessee, a city about 30 minutes west of Knoxville. Landenberger admits that as a gay kid skateboarding at his local skate park in a suburban Tennessee, he never felt all that welcomed by other skateboarders. As a result, Landenberger thought of his queerness and his skateboarding as two separate parts of his identity that could never intersect. It wasn’t until professional skateboarder Brian Anderson came out as gay in 2016, that Landenberger began to realize there could be a space for him to be openly gay while also being embraced within a sometimes homophobic skateboarding culture. “It all really started with Brian Anderson coming out and with [queer skate groups] popping up and seeing [LGBTQ] people coming more into the spotlight," he explained, "and realizing there was an interesting connection and this interesting subculture popping up." Since 2017, Landenberger has been traveling to different cities and documenting the lives of lesbian, gay, bisexual, transgender and queer skateboarders for his photo project titled “Queer Skateboarding.” Through his portraits, Landenberger hopes to highlight the growing emergence of queer skateboarding culture in cities ranging from Atlanta and London to smaller towns like Schertz, Texas. With LGBTQ skate groups and events popping up in other cities like Toronto and Portland, Oregon, and magazines like Skateism celebrating the diversity within the sport, a culture centered on queer skateboarding continues to grow in reach. This growth has been bolstered by the visibility of out professional skateboarders like Anderson and Lacey Baker, who was recently named to the first U.S. national skateboarding team as the sport is set to make its Olympic debut in 2020. Landenberger mentioned both Anderson and Baker as inspirations for his work, and through his photography, he wants to focus on the visual subculture inherent to the sport, as well as the ways LGBTQ skateboarders are adapting a persona and style in a subculture that hasn’t always been so welcoming. “I thought it was interesting how queer people are taking these objects like skateboards and clothing and things like that and subverting them and queering them into their own thing and differentiating themselves from skaters while still being skaters,” Landenberger said. Camila Izaguirre first connected with Landenberger through Queer Skate Atlanta, a Georgia skate group that organizes local events, and she has also been a participant in Landenberger’s photography project. Izaguirre grew up in Marietta, Georgia, and said skateboarding was something she always wanted to learn but had initially felt too intimidated to go to the skate park alone. 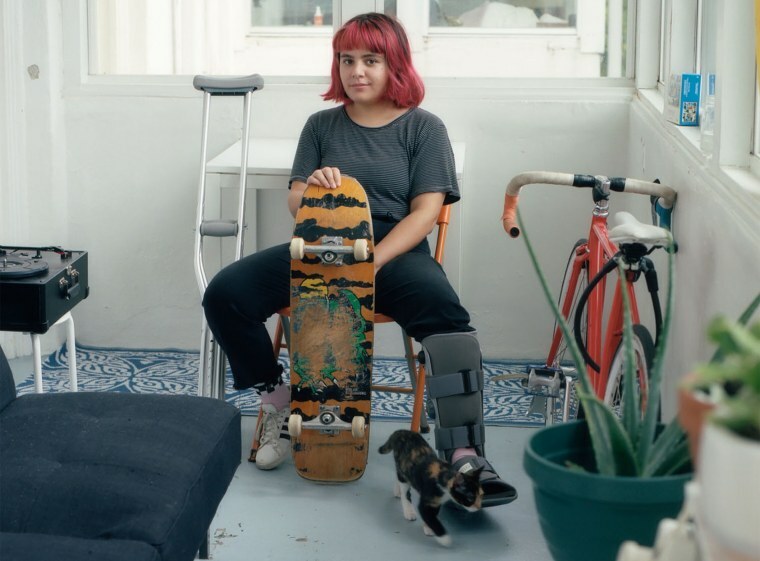 Izaguirre is excited about the emergence of a queer skateboarding culture, which she says can be as simple as putting together a skateboarding session with other queer individuals. Debra Akinlade, who has also participated in Landenberger’s photography project and Queer Skate Atlanta, said queer skateboarding is helping to add a level of diversity to the skateboarding community while strengthening the community aspect that has always been important to the sport. Jason Bard of New York first connected with Landenberger more than a decade ago through skateboarding forums when they were both still teenagers. Bard said finding other LGBTQ people to skate with has been a reason to get back into the sport again. For Bard, the emergence of a queer skateboarding culture has helped make the experience more empowering, inclusive and individualistic. And it is this message of empowerment, inclusivity and individuality that Landenberger is hoping to capture through his photography project. “I want people to take away [from the photo project] that whatever brings you joy or provides you escape, you can make a space for you and how you identify and all the intersections of your identity,” he said. “Not just in sports but in anything. There can be things that already exist and may not be inclusive to you or your community but you can make that space."